Mondsee is a little town in Upper Austria located on the shore of the lake Mondsee. In the year 748, the Bavarian Duke Odilo II founded the monastery on the site of a former Roman settlement. 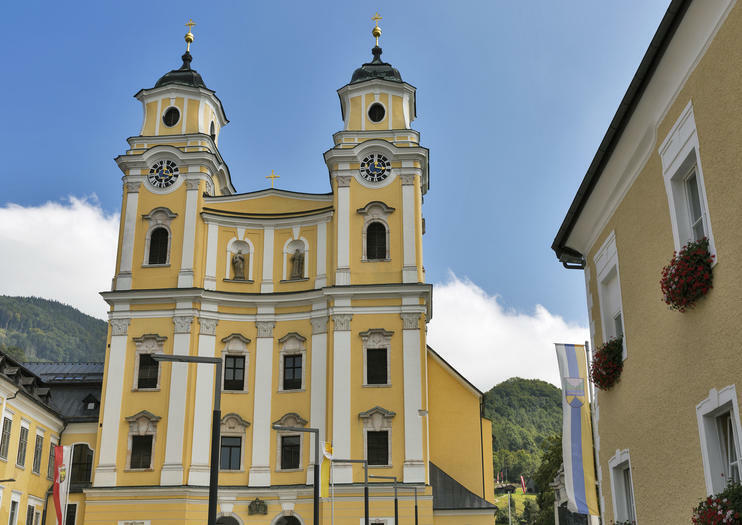 You might better know the Mondsee Cathedral as St. Michael’s Basilica, where the wedding scene in the iconic film ‘The Sound of Music’ took place. Home to the Mondsee Abbey, the cloister church was cemented in popular culture forever when Maria and the Baron Georg von Trapp walked down the aisle in the 1965 movie musical. The Mondsee Cathedral is located directly in the middle of the town center, next door to the monastery building and courtyards (which are open to the public). The abbey is one of the oldest (and the most picturesque!) in Austria. Inside, the most famous ‘resident’ of the Mondsee Cathedral is the skeleton of Abbot Konrad II, who was killed in 1145 defending the monastery from noblemen who wanted to repossess the land. The cathedral is easy to spot – the former Benedictine abbey church’s two towers are visible from almost anywhere in town, and the basilica is painted a distinctive bright yellow. Admission is free, and the cathedral is open every day from 9 a.m. to 7 p.m.
Take in Austria, the Czech Republic, Germany, Hungary, Slovakia and Switzerland on this 7-day European highlights tour from Frankfurt. Travel through Europe with a guide and explore top attractions such as St. Vittus Cathedral and the Charles Bridge. Delve into Budapest’s ancient history in Buda and Pest, enjoy sightseeing tours in pretty Vienna and Lake Mondsee, and delve deep into Germany’s beautiful Black Forest region. Explore Alpine regions including Lucerne, Mt Titlis and Zurich, marvel at the mighty Rhine Falls and gaze over serene Lake Titisee. Visit 11 European countries on this 14-day best of Europe tour from Frankfurt. Explore the city of Bonn and visit Cologne Cathedral. Take in top Paris attractions, including the Arc de Triomphe, the Eiffel Tower and the Louvre Museum, and sip Champagne in Reims. Soak up the atmosphere in Frankfurt's Roemerberg Plaza and discover medieval history in Prague. Admire St Martin's Cathedral in Bratislava and discover the delights of Hungary's capital: Budapest. Then, travel through Salzburg to the soaring peaks of the Swiss Alps. Explore thousands of years of diverse art, history and culture across 11 countries on this 21-day best of Europe tour from Frankfurt. Travel through Austria, Germany, the Netherlands, Switzerland and beyond with a guide, and find out what makes these proud nations tick. Admire famous artworks in Vatican City, enjoy outdoor adventure in the Swiss Alps, shop till you drop in Milan — Italy’s fashion capital — and stroll along the Seine River in romantic Paris. This adventurous tour includes minimum 3-star accommodation in the cities visited, with continental breakfasts. Join this 14-day tour through Europe combining the best treasures Europe has to offer for an unforgettable experience. Explore 19 different popular European cities in 10 countries, including visits to Prague, Budapest, Vienna, Mt. Titlis, Amsterdam, Brussels and Paris.